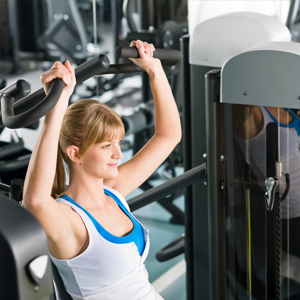 The Five Points Group Strength Training program allows members to participate in small 2-5 person training sessions coached by a Personal Trainer. These sessions allow members to take part in motivating/fun workouts where they are being directed and supervised by a professional while sharing their fitness experience with others. Members enrolled in the group training program workout on the mezzanine level of the fitness center. This area has been created exclusively for the Five Points group training program. The separated area allows group training participants a more intimate, less confusing setting. Participants in the fee-based classes pay far less per session than they would as an individual. And although the workouts are performed in a small group environment each and every program is tailored to meet the goals and fitness level of the individual. Traditional and functional training methods, as well as TRX and balance exercises, and short bursts of cardiovascular training, are just some of the tools used in any given workout. With Small Group Training expect the the unexpected because no two workouts are ever the same. For a complimentary small group training session please contact our membership services staff.